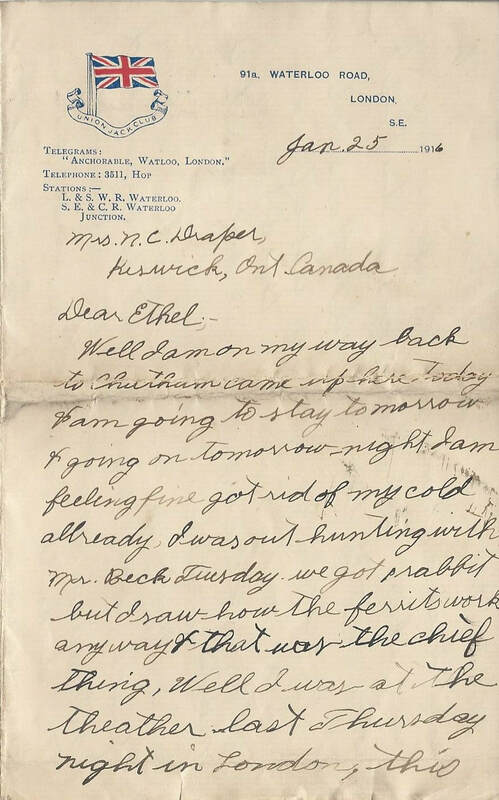 As we can see from the letterhead of this letter, Noah appears to have started this letter while at the Union Jack Club in London. 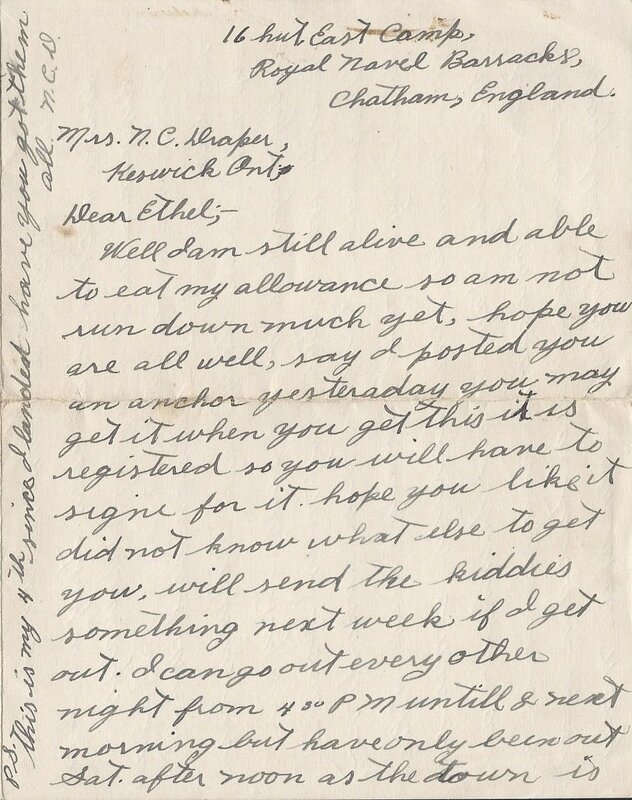 Perhaps he even wrote his letter at one of these tables before setting it aside and then finishing it on the 29th while back at the Chatham Naval Barracks. Writing Paper: 9" x 7" medium-light weight, smooth, folded into booklet form, but with the inside page written across the 7" width and all the way down the 9" length like foolscap. The pages are not numbered. ride would like to go out in the summer. I smoke enough for the two of us, haHa. ​hut as it looks pigish, HaHa. to one and all, yours as B.4. 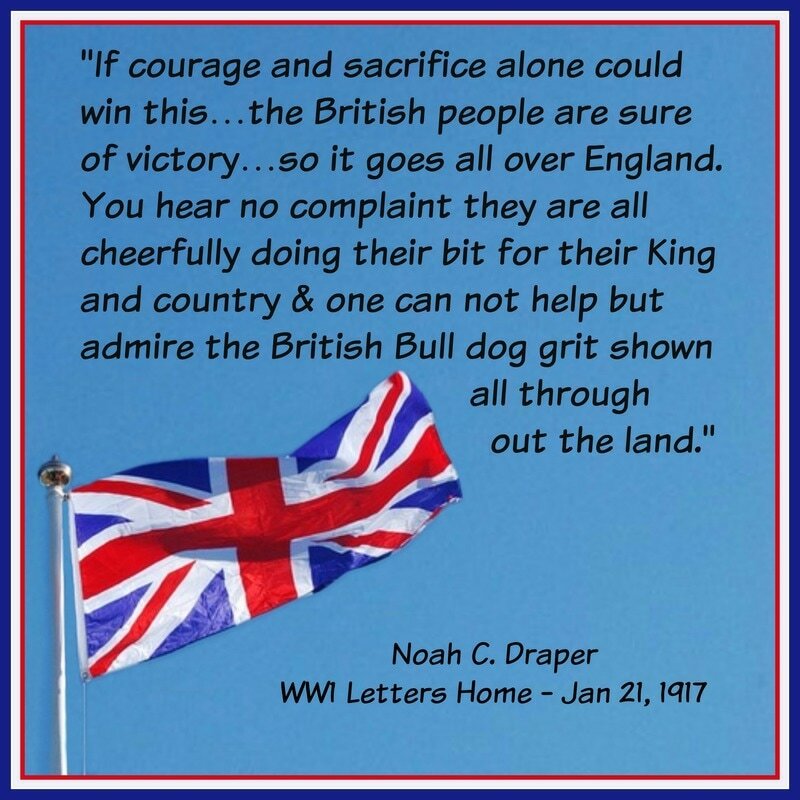 ​Noah begins this letter while at the Union Jack Club in London which was an imposing building with quarters and everything a visiting soldier, sailor or airman would need. 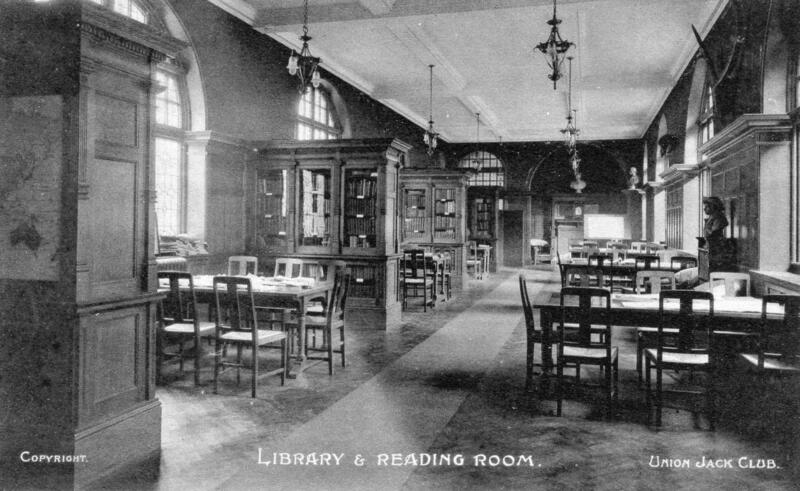 It included a canteen, library/reading/writing room, and recreation room with billiard tables. 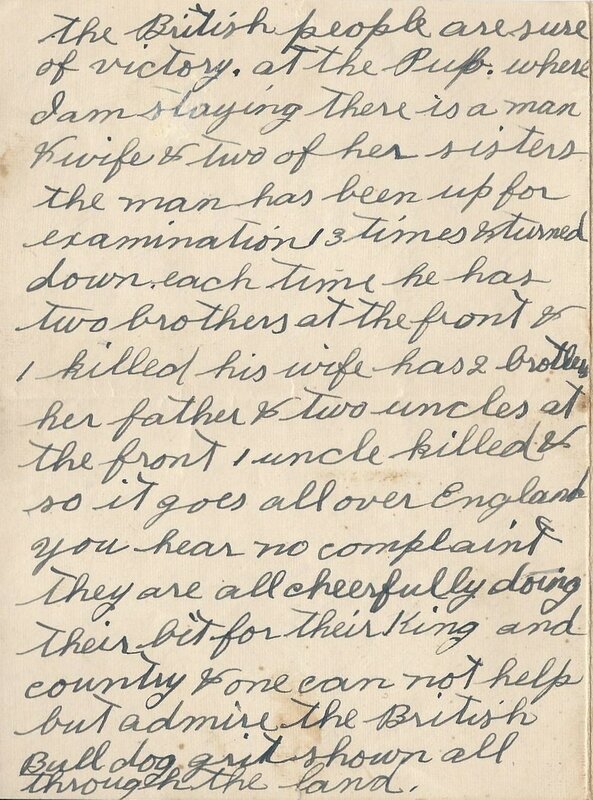 It's interesting to note that the initial idea was from a Royal Red Cross nurse with field experience in the South African War. 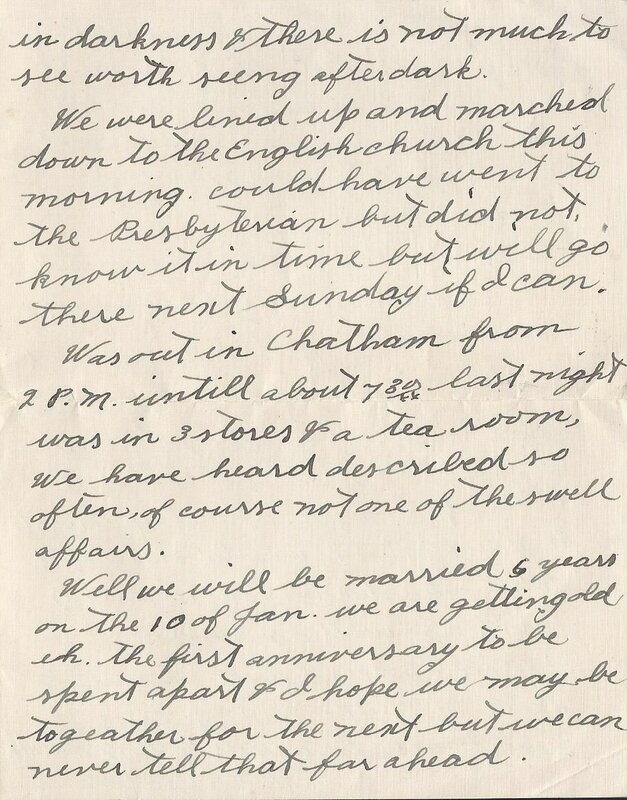 Determined not to start such a serviceman's club in debt, the initial £60,000 was raised by galas and functions, with the rest coming from the idea to name a room for £100. Thus, there came to be a "Lady Conan Doyle Room" after Sir Arthur Conan Doyle made a donation on behalf of his wife. 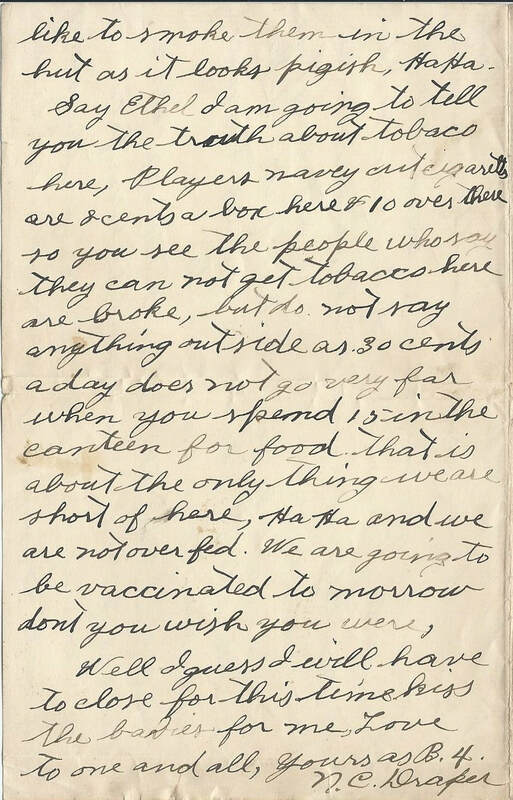 ​​In this letter, Noah makes a shrewd observation that although serving members kept writing home and asking for cigarettes to be sent over, it wasn't due to a tobacco shortage overseas, but a lack of budgeting on behalf of the men themselves. 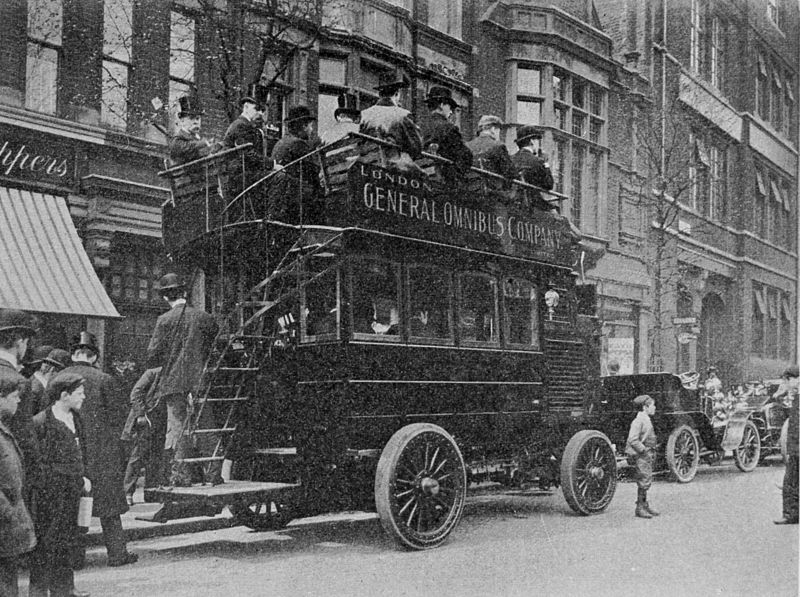 Motor omnibuses, such as the one shown below by the London General Omnibus Company (LGOC), were first used in London in 1902, so when Noah mentions a two decked bus, this is the type he is referring to, with the open top deck and no track on the streets. on a big shoot Thursday. eh. so it goes all over England. 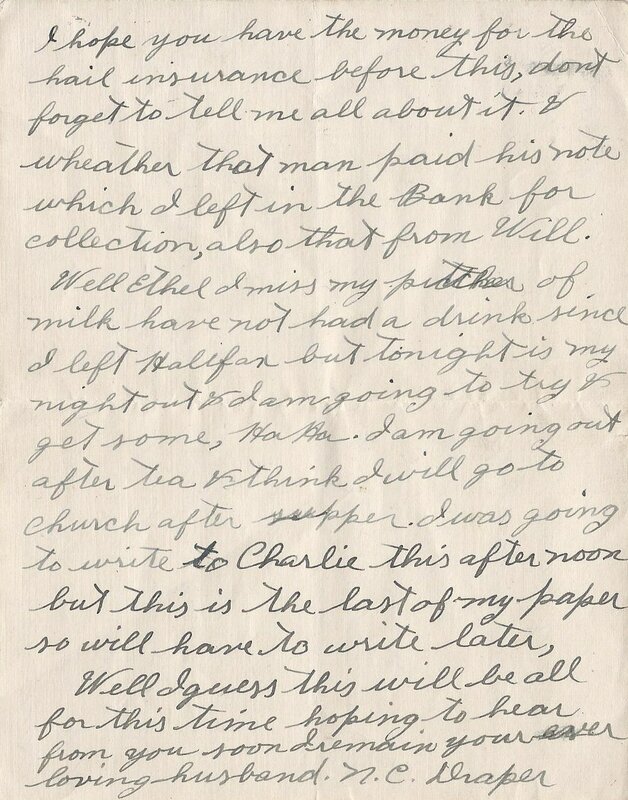 Note - Noah has not signed off on this letter. Perhaps he did so on the envelope. 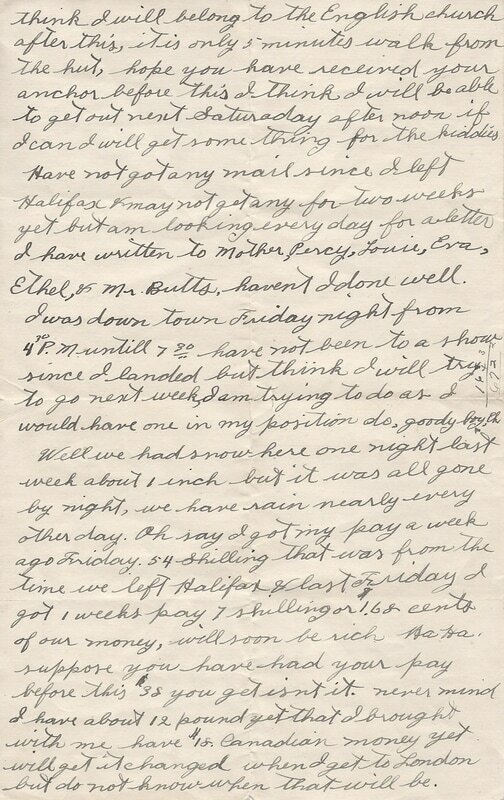 Or, perhaps there is another page which we haven't located or matched with this letter. If we find more, we'll add it here and post an update. 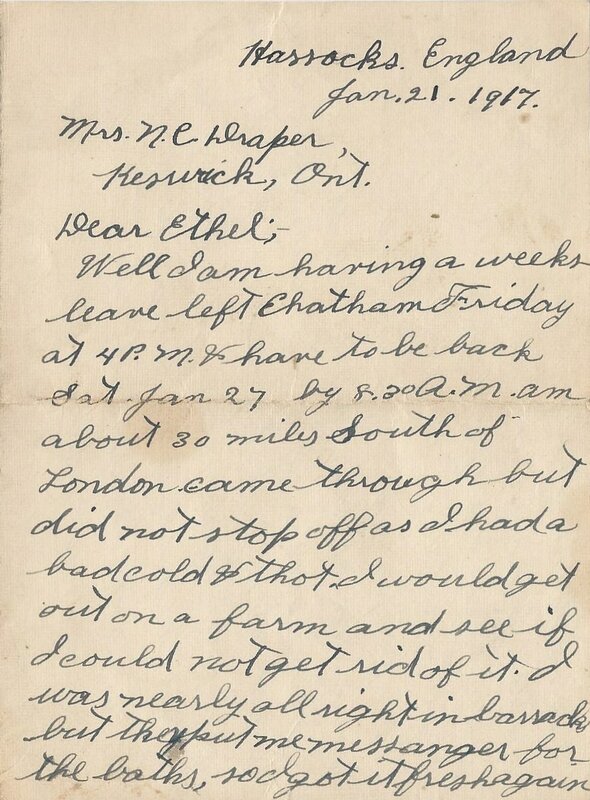 In this letter Noah is in Hassocks, Sussex enjoying the country air while he recovers from a bad cold and regains his strength. He doesn't say how he decided on the village of Hassocks, but I'm guessing it was on the advice of others since it lies at the foot of the South Downs,"...a range of chalk hills that cover about 260 square miles across the south-eastern coastal counties of England..." (wikipedia) And yes, it encompasses the infamous white cliffs of Dover. To get to Hassocks, Noah would have taken a train on the London, Chatham and Dover Railway (LCDR) and then transferred in London onto the Brighton Railway, (officially the London, Brighton and South Coast Railway(LB&SCR) 1846-1922). Noah would have arrived at the Hassocks Railway Station that you see in the image at the top of this post. We don't know which pub he stayed at, but there's a very good chance he stayed at the Friar's Oak which had been there since medieval times. 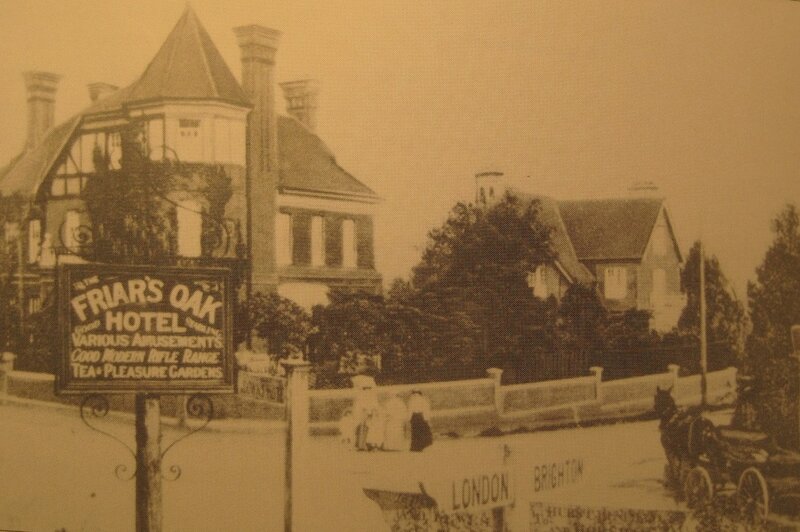 The Friar's Oak Hotel was a coaching station where spent horses were exchanged for fresh ones. The www.keymerclaytonwarmemorials.files.wordpress.com site relates the history of, and pays tribute to, the 54 men of Keymer and Clayton (village south of Hassocks) who gave their lives while defending their country. 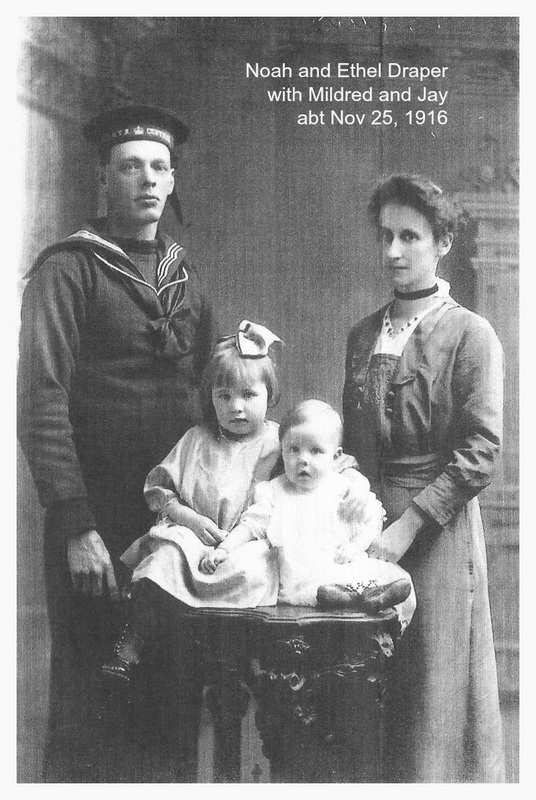 The following image is from their site, one of many which show the area and the lives of the brave men who are honoured here. 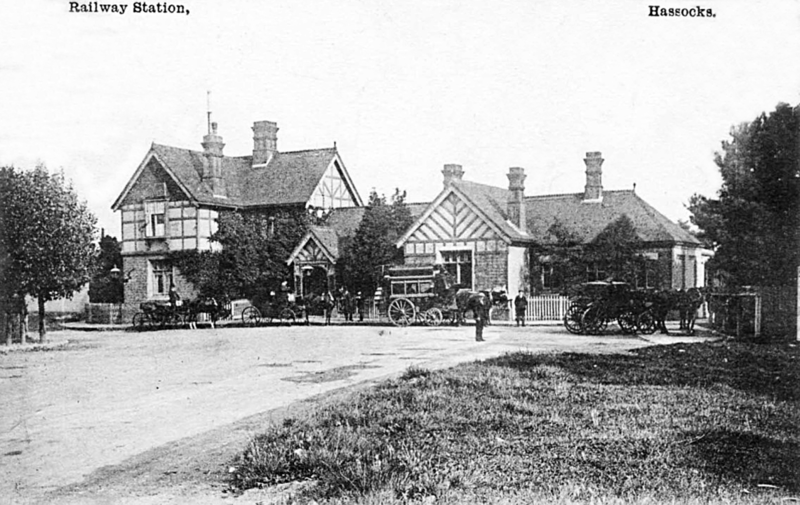 Hassocks is 43 1/2 miles from London, according to the book, Great Britain: Handbook for Travellers, 1890, and the word 'hassock' is Anglo-Saxon for small wood. This makes sense, considering that The Friar's Oak Hotel is adjacent to another landmark, Friar's Oak Fields, Farm, and Woods. 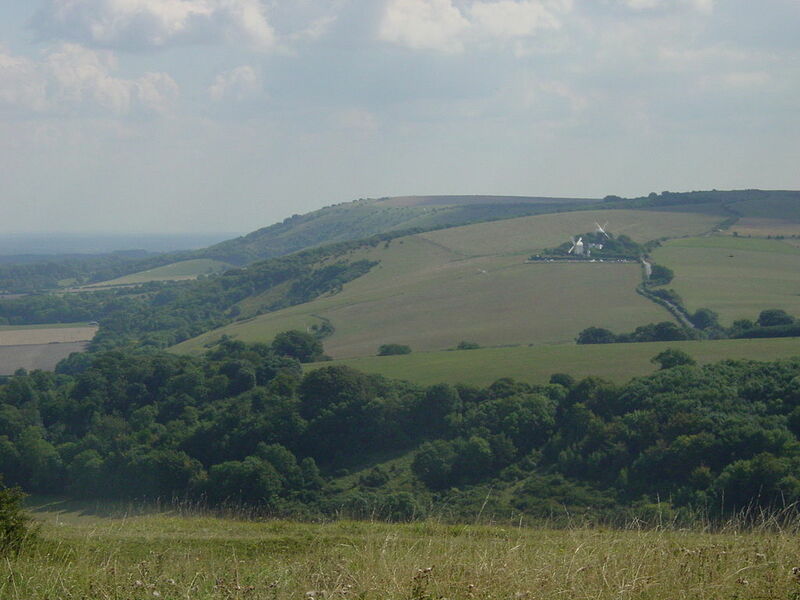 From Hassocks, our prairie farmer Noah, would have ​been able to see the escarpment which delineates the start of South Downs. It's called Wolsonbury Hill and has many fine walking trails even today. 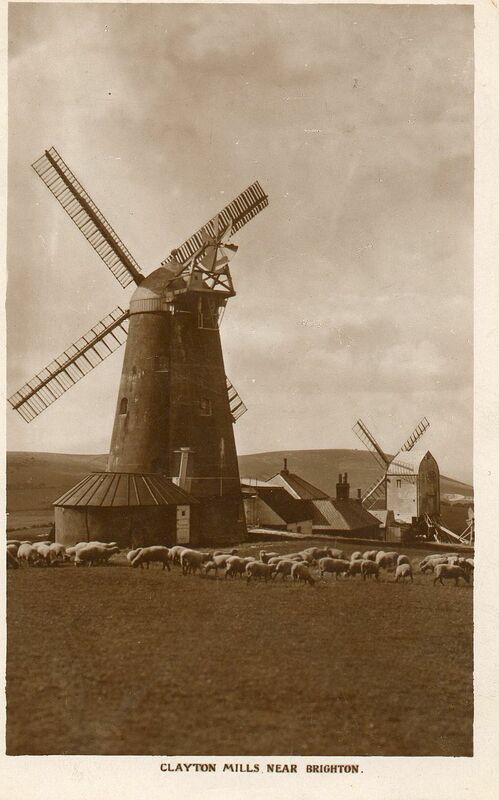 He would also have seen the twin Clayton windmills, affectionately called, Jack and Jill. This is a modern image of the spot he would have seen if he were standing about a mile south of the pub where he was staying. Perhaps not as bushy though as I've read that scrub is encroaching on the fields. The Clayton windmills are near the top right of this image. The view east of Clayton along the escarpment showing the Jack & Jill windmills. Courtesy of wikipedia. Jack and Jill Mills, Clayton, showing the roundhouse of Duncton Mill. 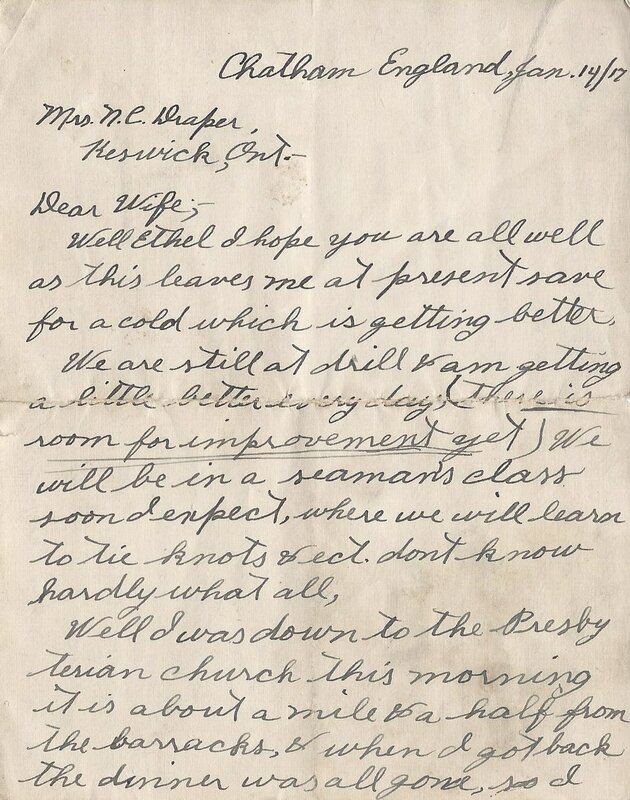 Jack builit in 1866, stopped working in 1908. Courtesy of wikipedia. ​Since Noah visits castles and other historic sites in future letters, perhaps he climbed Wolstonbury Hill to check out the remains of a Bronze Age fort. The view would have been marvelous as the guide book says you can see across South Downs on one side, and to infinity as you look to the north. What a memory for Noah to think on when he returns to our flat Saskatchewan prairie. 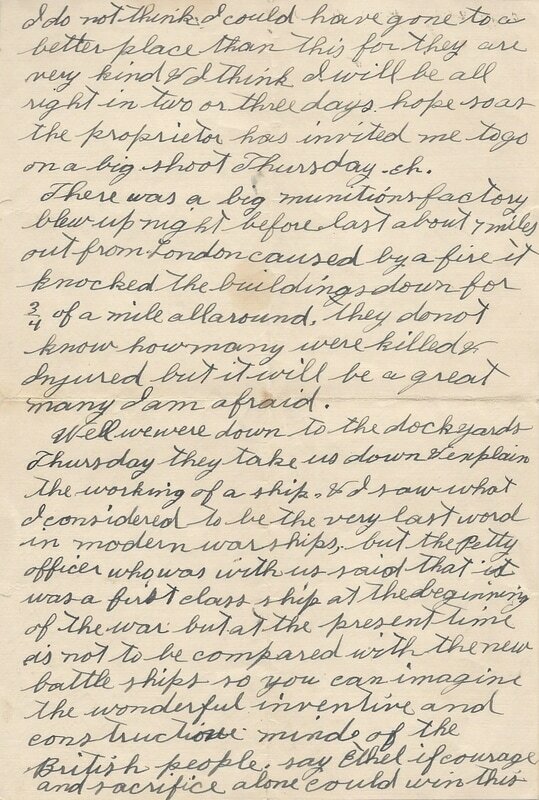 On the second page of this letter, Noah mentions the explosion of a munitions factory outside of London. This was a horrific event where 73 people died and more than 400 were wounded. Instead of relaying all the information here, I'm posting a YouTube video courtesy of the BBC which relays the facts with personal accounts and images. It also shows videos of women and men making munitions. 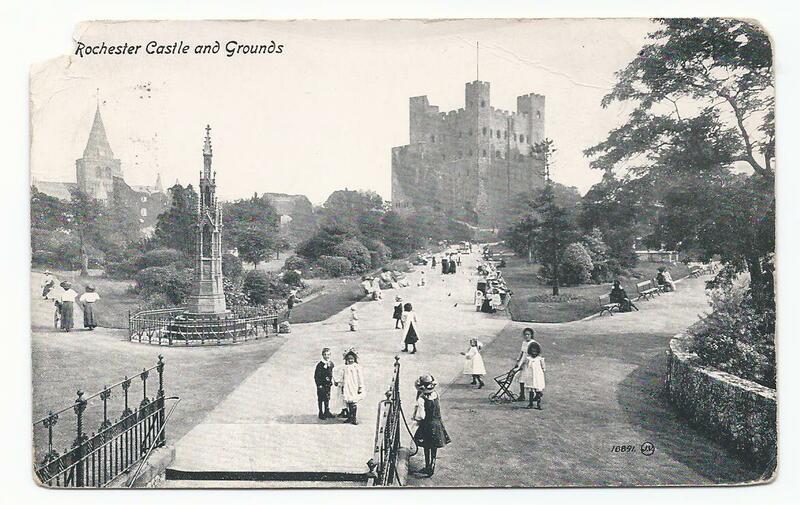 Postcard shows image of Rochester Castle and grounds. See History notes below for more info. Mother - Sarah Sophia Deverell Draper, Noah's widowed mother. 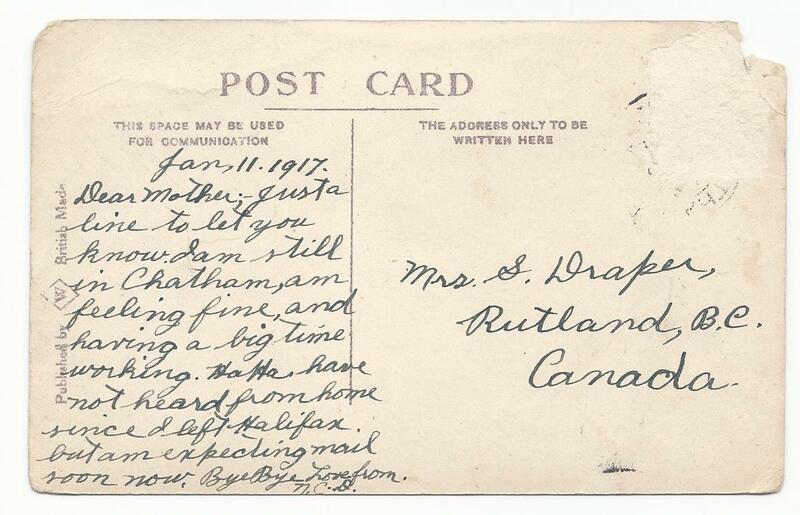 Since the postcard is addressed to her in Rutland, B.C., Sarah is visiting her daughter, Sarah Louise Draper aka Louie, who married Fred Coventry and recently moved to Rutland, outside Kelowna, from the Grand Coulee area, along with Fred's parents. soon now. ByeBye Love from. Rochester is a town on the River Medway close to Chatham and HMS Pembroke. Noah probably passed the castle on his way to London. ​By 1890, the grounds were turned into gardens and the park-like setting opened to the public. Looking at his postcard, I wonder if Noah walked along the sidewalk and explored the castle and keep. 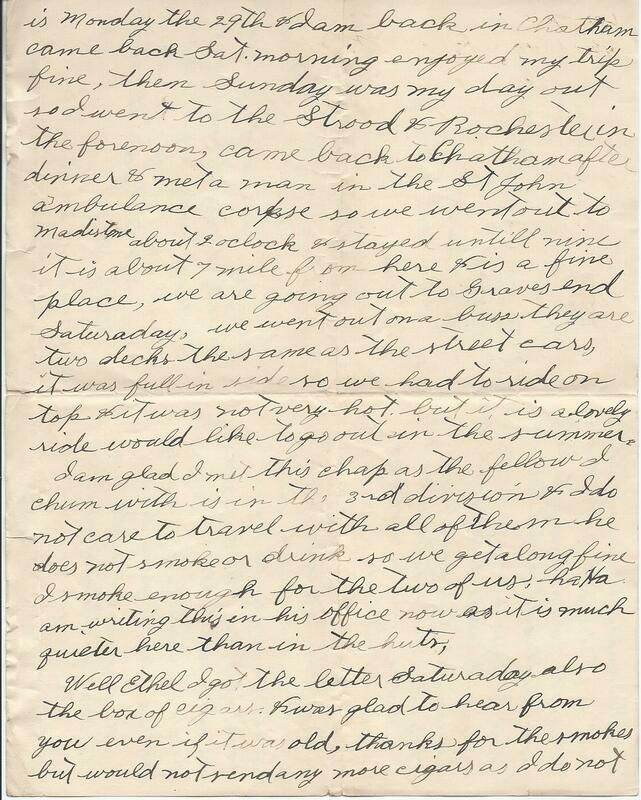 Noah mentions that sitting in a double decked street car feels like "​riding on a boat swaying sideways." A bbc.co.uk post, ​How did people travel? shows one of the best views I've seen on people riding in a double decked street car and so you can imagine what Noah meant. 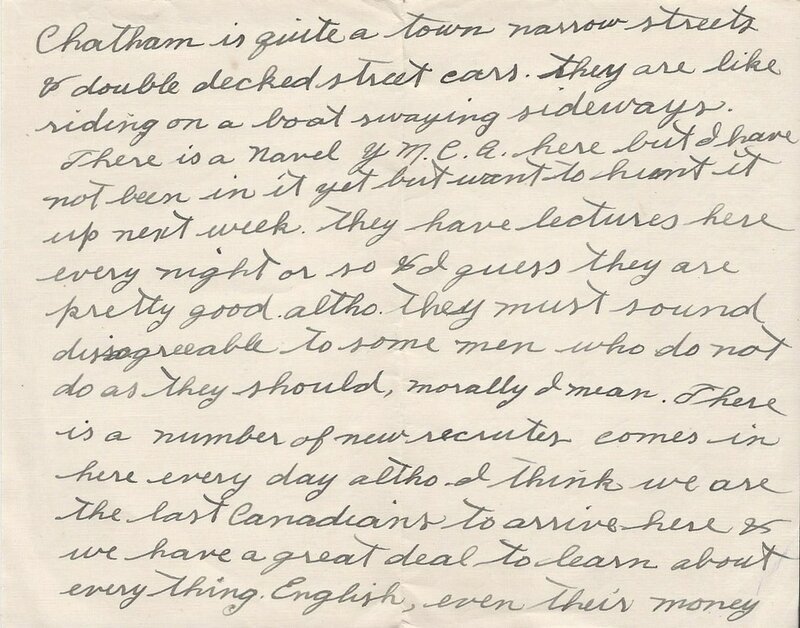 Addressed to: Mrs. N. C. Draper, Keswick, Ont. Writing Paper: 10" x 6.5" medium weight, semi-rough, folded into booklet form. 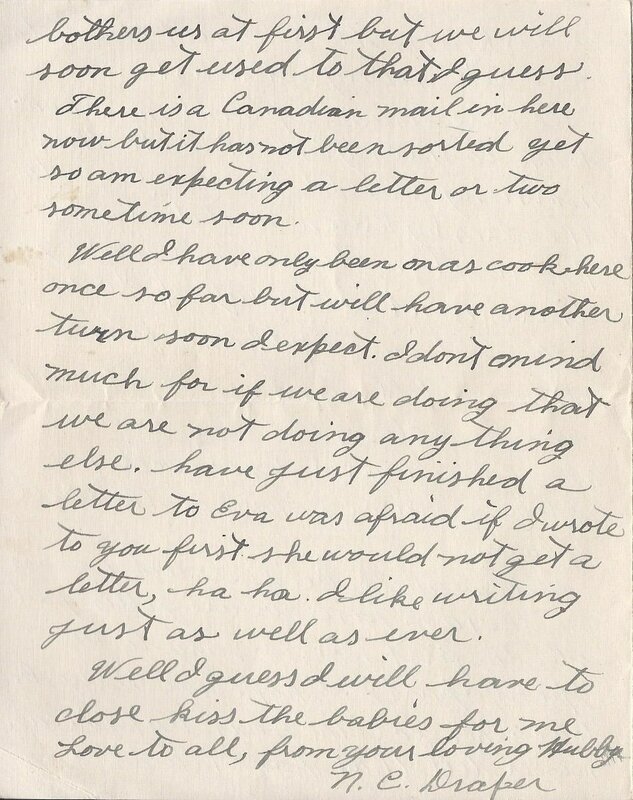 Noah hasn't numbered the pages, but he's using the same technique he used for some of his previously posted courtship letters to Ethel, where his first page is the front "cover", then he's opened it and written on the right side, then moved over to the left side - turned the page sideways - and written there, and finally, he's closed it and written on the back. For clarity, I'm posting the pages in the order they were meant to be read. P.S. this is my 4th since I landed have you got them all. N.C.D. see worth seeing after dark. there next Sunday if I can. ​never tell that far ahead. ​riding on a boat swaying sideways. soon get used to that I guess. just as well as ever. 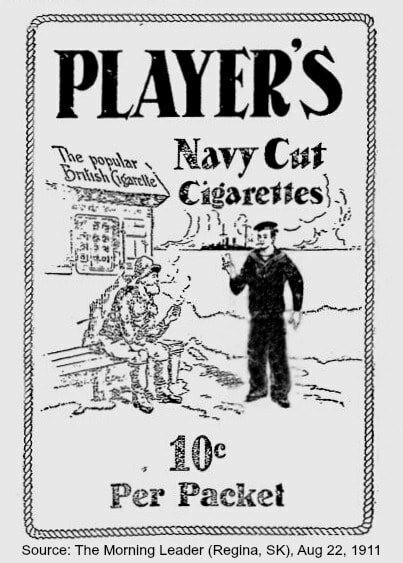 Begun in 1844 England, the Y.M.C.A. 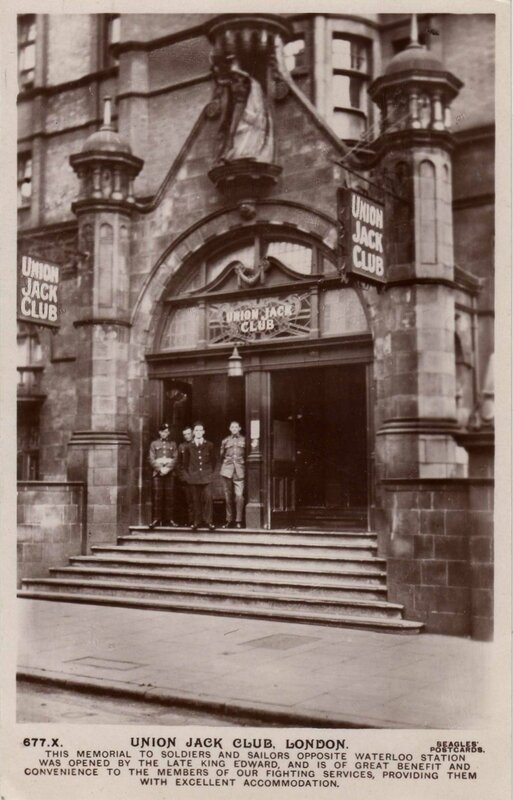 was a social club which served as a home away from home for male travelers as well as soldiers, sailors, and airmen. 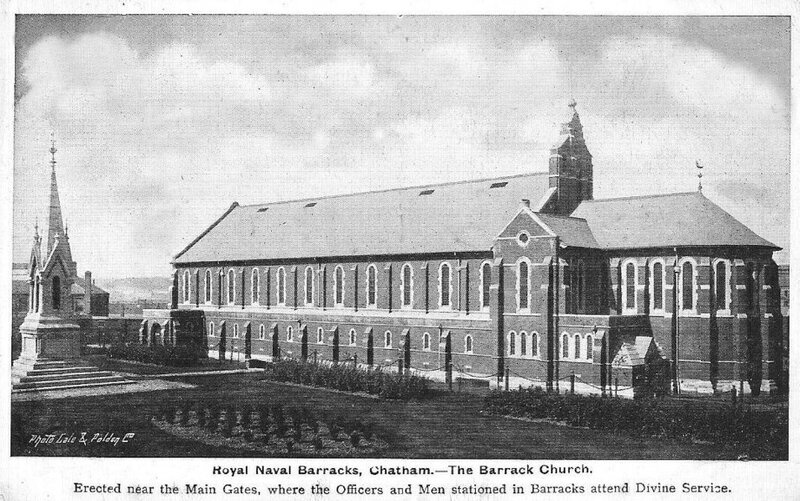 The facilities were similar as present day with some including a gymnasium and swimming pool, as well as game room, reading room, and a place to partake in wholesome food and refreshments. 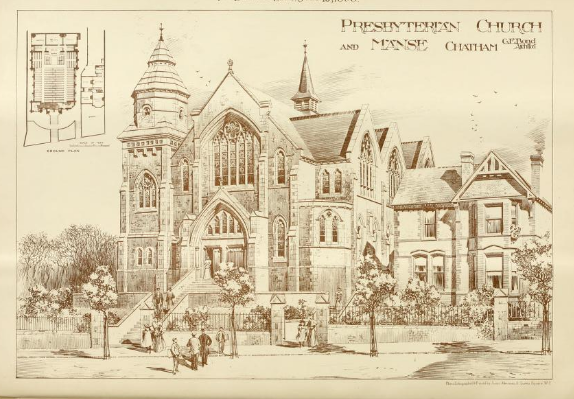 I've found "English Church" on Upper Canada and Canada West census records and understand it to mean the Church of England. 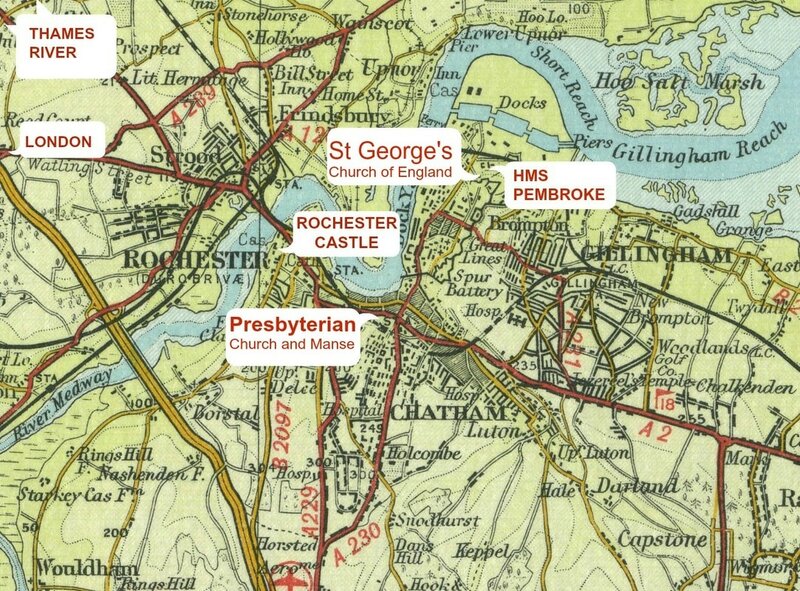 In Noah's case, he means St George's Church aka the Naval Barracks Church, which was part of HMS Pembroke. 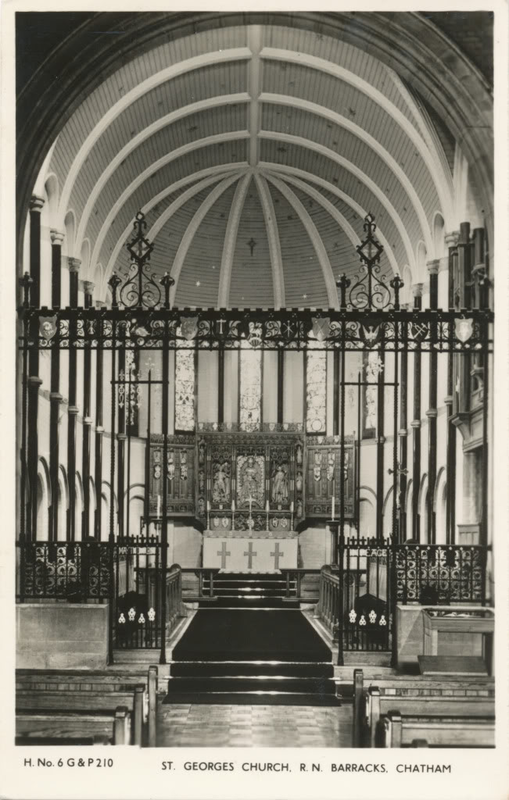 The church was built in 1906 and is shown in the next two photos. ​To continue from the top of this post, the bbc.co.uk post, ​How did people travel? 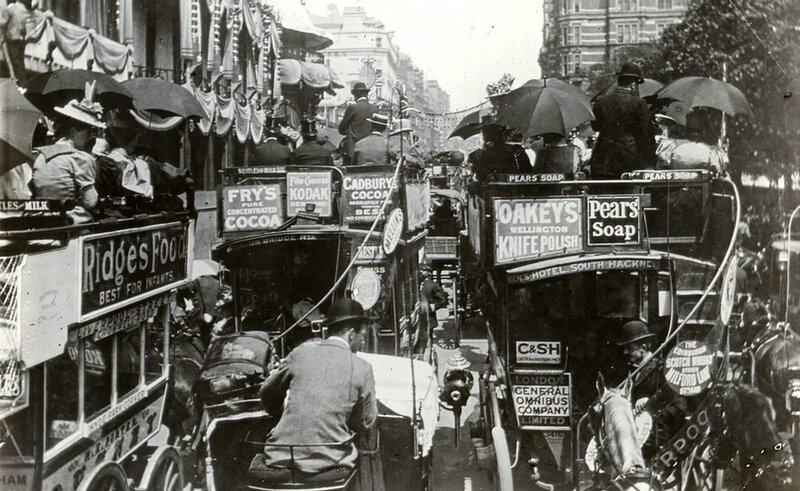 goes on to say that in 1900 most vehicles on the Britain's streets were horse-drawn, but by 1914 motor buses and electric trams were more popular for public transportation. 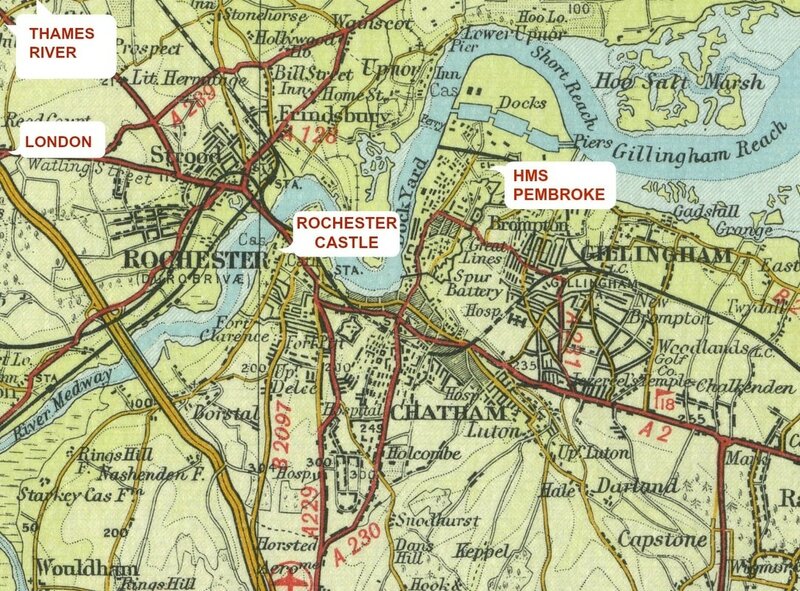 Next to the Royal Naval Barracks was the Pembroke Gate to the Chatham Dockyards where civilian workers and longshoremen worked and maintained the ships. 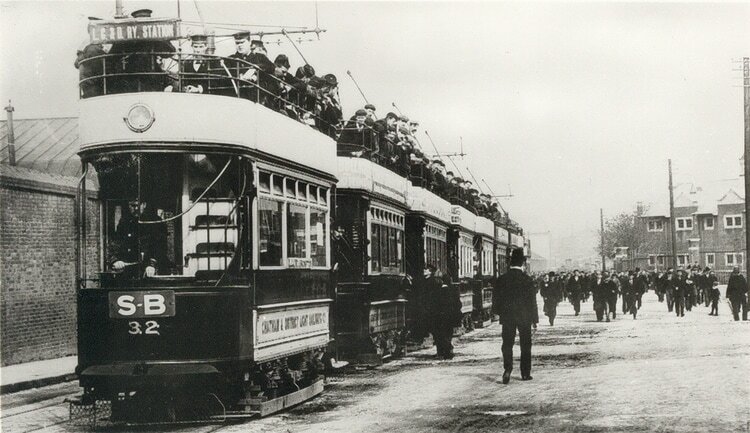 I found this photo at Chatham & District Traction Company which shows double decked trams waiting for the workers at the Pembroke Gate. A line of cars waiting for Dockyard workers at Pembroke Gate. Courtesy of Chatham & District Traction Company. The Friends of Chatham Traction are in the process of restoring, exhibiting and operating the sole surviving Chatham Traction bus, GKE 68, and although it ran 20 years after Noah's naval tour of duty, I'm posting this information as a thank you for allowing their photos to be used and shared for education and promotion.